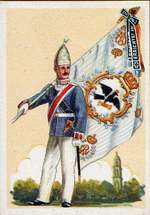 The „Traditionsmusikkorps Erstes Garderegiment zu Fuß" (1st Foot Guards Traditional Music Corps) was founded in order to perform historical military music in a historical atmosphere, even in Germany. It is our goal to present the audience military music of the German Empire until 1918, performing it most authentically, according to the military drill book for the infantry of 1906. 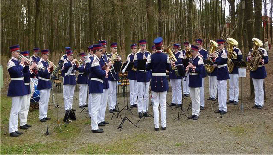 Modern instruments that found their way into military music at a later time, as the saxophone or the sousaphone, are deliberately left out of the “Traditionsmusikkorps”, as we endeavour to perform traditional military music with traditional instruments according to traditional regulations, as pure as possible. In order to provide the audience with the best, most original visual impression, the “Traditionsmusikkorps” dresses in historical uniforms, tailored after inherited originals and the military dress code of 1903. As a result, the audience gets an acoustic and a visual impression of how a military parade in Potsdam might have been, at about 1900. Finally we would like to remark that the “Traditionsmusikkorps” does not glamorize war or military actions in any way. Our association is motivated only by the affection to historical music and uniforms. No harmful political aspects or propaganda whatsoever are approved or spread by us, so please do not send any requests adhering to those. They will not be answered. No more and no less are the intentions of the “Traditionsmusikkorps Erstes Garderegiment zu Fuß e.V.”. Traditionsmusikkorps Erstes Garderegiment zu Fuß e.V.